CVS 181 Tooth Shear Thompsone Heavy pattern. CVS 182 Tooth Chisel with Guard. CVS 183 Tooth rasp Set of 3. CVS 186 Catheter for mare Metal. CVS 190 Bailing gun for horse with spring. 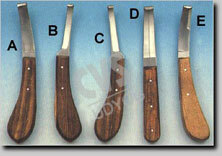 CVS 191 Drawing knife French pattern. 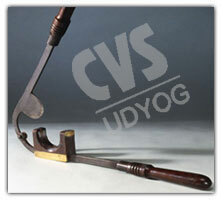 CVS 192 Hook Knife wooden handle. CVS 193 Farrier set of tools in a canvas case with strap Containing harmer, buffer, rasp, pincer, hoof knife,Stone for sharpening Hoof Knife complete set. CVS 195 Mouth gag varnell's with regulating screw & jaw. 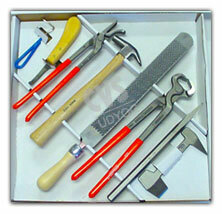 CVS 196 Firing iron set of 3. CVS 197 Hoof testing forcep. CVS 198 Stomach pump Complete with rubber tube. CVS 199 Casting rope cotton 10 meter with leather bound ends. CVS 200 Wound Syringe with extra nozzle 4oz. CVS 201 Drenching Bottel army Model.